Guatemala is currently facing one of the largest political crises in the nearly two decades since the end of the country’s 36-year-long internal armed conflict. A growing corruption scandal has brought hundreds of thousands across Guatemala to the streets to demand the resignation the corrupt political class, and has already led to the resignation of the Vice President. On May 16, tens of thousands of Guatemalans took to the streets of the capital city to express their rage with their corrupt politicians, and to demand that they all resign. The weekly protests have drawn tens of thousands to the streets in an organic, decentralized mobilization of indignant citizens demanding that all the corrupt politicians must go. The demonstrations began shortly after a joint investigation by Guatemala’s Public Prosecutor’s Office and the United Nations sponsored International Commission Against Impunity in Guatemala (CICIG) uncovered a massive tax fraud ring, which has become known as “The Line.” On April 16, 22 people, including current and former heads of the Guatemalan tax collection agency were arrested for defrauding the state of $120 million dollars. The administration was initially able to avoid being linked to the fraud ring, but came under intense scrutiny after Juan Carlos Monzón, the personal secretary of Vice-President Roxana Baldetti, was identified as the leader of the crime ring. Soon after the charges were filed, Monzón disappeared in South Korea while on an official visit alongside the Vice-President. The Vice President quickly took steps to distance herself from her former secretary. On April 19th she held a press conference to give her side of the story, but quickly cut off the event because of intense questioning by the Guatemalan press, further stoking mistrust in the administration. 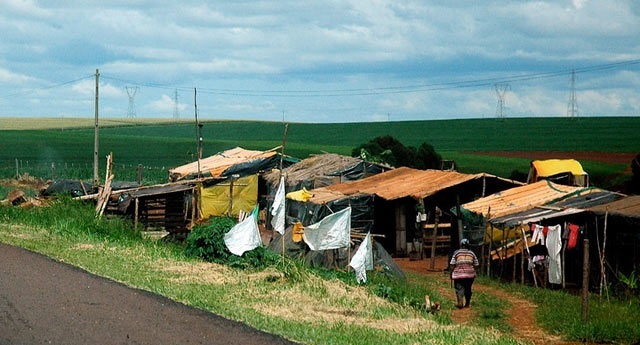 Shortly after Guatemalan society erupted in indignation and began demanding the resignation of the Vice President, President, and other members of the administration thought to have been involved in the scheme. The “Resign Already” movement was born. 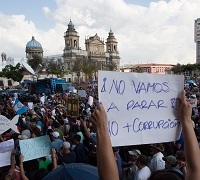 On April 25, nearly 40,000 people from across Guatemalan society gathered in Central Park in the first of weekly protests against corruptions. The protesters were entirely non-violent, with many families coming out to participate in the day. But despite the non-violence, the Guatemalan National Police’s riot squad was prepared in case the protesters decided to march on the Presidential Palace. The protests have represented a diverse section of Guatemalan society, and have quickly expanded to nearly all of Guatemala’s 22 departments. These protests have exposed the deep-seated frustration in Guatemalan society with inequality in the country. Many protesters expressed indignation with the fact that government officials and the elites raked in millions while public institutions such as schools and hospitals went underfunded. On May 6, the CICIG announced that they were opening an investigation into the participation of the Vice President in a criminal ring. Early in the evening on May 8, nearly an hour late, the Guatemalan President Otto Pérez Molina went before reporters to announce that his Vice President, Roxana Baldetti, had resigned her position. Following the President’s announcement, thousands returned to Guatemala’s Central Park to celebrate the resignation. For those gathered in the park, the announcement was the result of weeks of popular protests against corruption in the administration, despite what the president said. But if the resignation was meant to appease the protesters, it greatly failed. If anything it energized the protesters as they turned their gaze to the president and other politicians thought to be corrupt. And the resignations didn’t end with Baldetti. Less than a week after the official announcement about the Vice President, Erick Archila, the head of the ministry of Energy and Mining, announced that he would resign over charges of corruption. On May 14, the Guatemalan congress ratified Pérez Molina’s choice for Vice President Alejandro Maldonado Aguirre. The new Vice President is a former Supreme Court justice that played an important part in overturning the charges of Genocide brought against former General Efrain Rios Montt in 2013. Protesters were quick to include the new Vice President in their targets of rage, accusing him of assisting the genocide of the 1980’s. But the new Vice President’s dark history runs deeper than attempting to erase the charges of genocide. During the administration of Colonel Carlos Arana from 1970-1974, he served as Minister of Education. It was also during this that time he worked alongside the Movement de Liberation National, an anti-communist death squad that disappeared thousands of labor union activists and university students. In 1985, Maldonado Aguirre made a failed presidential run during the 1985 presidential election under the National Renewal Party. In the end his party did poorly at the polls, and lost to Vinicio Cerezo and the Guatemalan Christian Democracy party in the first open presidential election since the election of Jacobo Arbenz in 1951. The administration of Guatemalan President Otto Pérez Molina has been in a perpetual state of crisis since his inauguration in 2012, but the frustration and indignation of protesters has also exposed a deep-seated disillusionment with the political system and wider political crisis. The Guatemalan daily newspaper Prensa Libre found that between 81-85 percent of those polled stated that they had “no intention of voting” in the country’s upcoming presidential elections in September. Many Guatemalans look upon the “democratic” political system as a farce. Elections are looked upon apathetically because of the common assumption in Guatemala that whoever lost the previous election will become the next president. 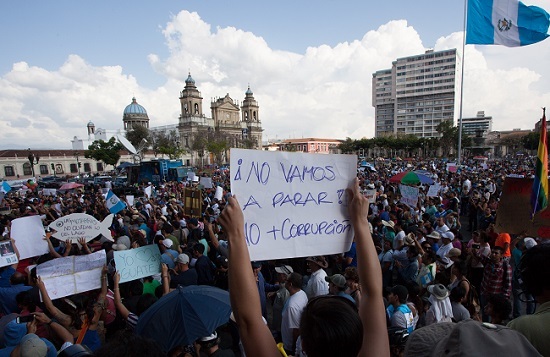 The presidential campaign has become the backdrop to the protests, with presidential, congressional deputies, and mayor candidates stating their shared anger with the corruption. Yet protesters aren’t buying the language of the candidates, and have turned their attention to the candidates as well. When Dr. Manuel Baldizon, a wealthy businessman with known connections to narco-trafficking, and who is widely considered to be the next president, arrived in the peaceful tourist town of Antigua for a rally, protesters were waiting for him chanting “He will not take (the presidential sash),” a play on his ad campaign declaring “he will take (the sash)”. The presidential candidate refused to leave his car, and quickly left the rally. The political crisis has brought calls by many protesters for a new form of local politics that move beyond the traditional hierarchy of the political structure. Other protesters and organizations have echoed this call for the formation of a new political organization.